“Double Fudge” (ragtime two step, 1902). “Nappy Lee” (slow drag, 1903). “Lovie Joe” (from the Ziegfeld Follies of 1910) (words by Will Marion Cook). “The Darkey Todalo: A Raggedy Rag” (1910). “Take Your Time” (comic song, 1905/1907). “I Am Waiting For You, Honey Dear” (ballad, 1914). “The Whippoorwill Dance” (piano solo, c.1921). Rick Benjamin, piano. “Dat’s Ma Honey Sho’s Yo’ Born” (comic song, 1912). “Brother-‘N-Law Dan: Sequel to ‘Lovie Joe'” (1922). “Pekin Rag – Intermezzo ” (1904). “Teddy Roosevelt’s ‘Bull Moose’ Song” (1912). “The Morocco Blues” (piano solo, 1922/1926). Rick Benjamin, piano. “Sweetie Dear Fox Trot” (1914). “Sweetie Dear: An Afro-American Serenade” (1906) (words by Will Marion Cook). Apendix A: Joe Jordan 1962 interview on Chicago’s Pekin Theatre. Apendix B: Joe Jordan 1962 interview on his 1910s European vaudeville tours. Joe Jordan (1882-1971) was the most famous and economically successful black composer/songwriter of the early 1900s. From a public acclaim standpoint, Jordan was “the man who Scott Joplin wanted to be.” Yet ironically, over time Jordan and his music faded completely from public memory, while his obscure friend Joplin rose to surprising posthumous super-stardom during the 1970s. This fine new digital recording, produced by Grammy winner Judith Sherman, sets the historical record straight by reintroducing Joe Jordan’s marvelous music to 21st century listeners. It is the first-ever recorded survey of his vast output of songs, rags, marches, and waltzes. 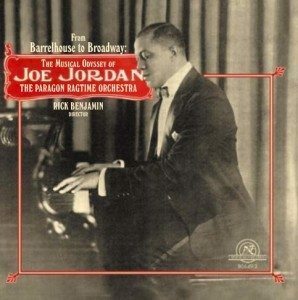 Tracing Jordan’s career as an 1890s ragtime pioneer to his breakthrough as a leading figure of the black musical theater of the 1900s, ’10s, and ’20s, Barrelhouse to Broadway is the Paragon Ragtime Orchestra’s stirring tribute to one of America’s most accomplished musicians.